If you have not yet looked seriously at Facebook as a channel for your business – I would urge you to start paying some serious attention. In this post I am focusing on the product within the product – i.e. Facebook Live. This is basically – going “live” to your audience and getting an instant two-way dialogue or conversation going. How do you go Live? Just about everyone should have the ability to go live by now, if you don’t have it – its on its way. What is the big deal about Facebook LIVE? Facebook is (right now) rolling out two-person live (on personal profiles only at the moment – and only on mobile) – so check if you have this! 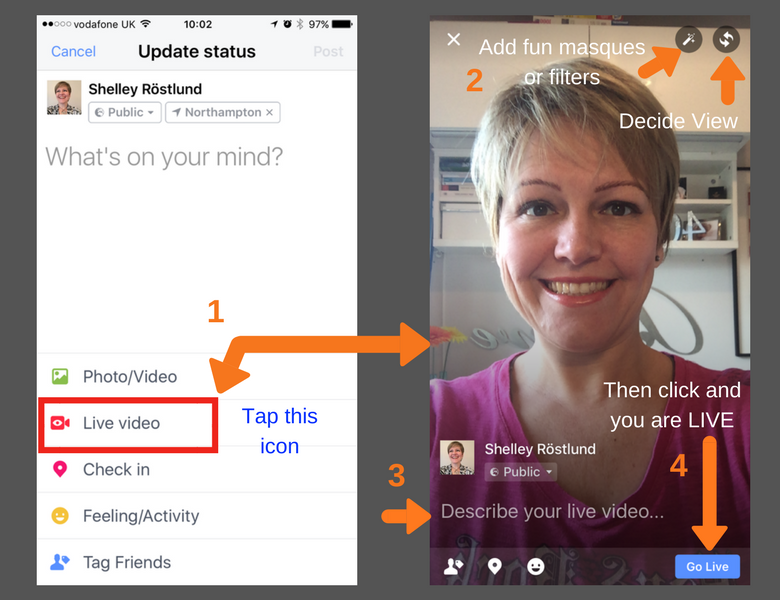 *** Note: any live stream session will have a very favourable influence in terms of newsfeed algorithm – which means that, by live streaming, you will reach more of your audience than with any image, text or pre-recorded video *** (correct at time of posting!). These are two adjunct things to think about – they are Facebook’s answer to Snapchat. Basically both of these only work on mobile and are there to give very quick, off-the-cuff insights to your friends and connections about your day. They only last for 24 hours (like Snapchat) and you have the ability to add filters, masques, text, emoticons, etc to your images and videos. Your audience can watch them and then comment back to you on them. They are not live – they are prerecorded. At the time of writing these two products are only available on personal profiles and in FB Messenger (as a user…not a Page). I reckon choose which one of these you will do – because it may be overkill to do both. 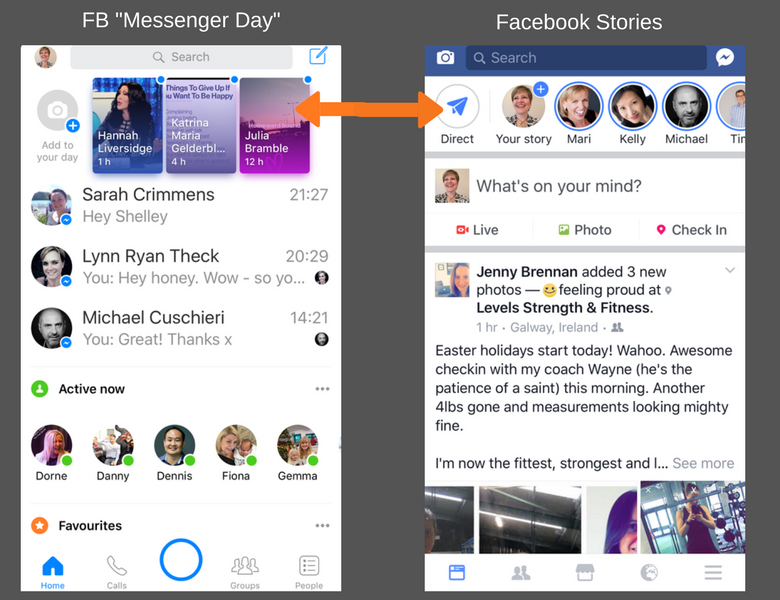 BUT – you may have connections on FB Messenger that are not necessarily Facebook Friends…so something to keep in mind. This strategy is not just about Facebook – it’s about looking at the other ‘live’ channels and seeing what your wholesome Live strategy is going to be. The only other contenders worth looking at are Periscope (i.e. Twitter) and YouTube. Have a look and see which channels will work for your audience. My advice – take the path of least resistance and most acceptance. In the social world that means – do not waste your time re-building a ship that you have already built – just learn to steer and navigate the ocean you are on. If you already have an audience that you have built (for example on Facebook) – do not spend months trying to start all over again on a different platform – especially when you have to spend tedious amounts of time convincing your fans to move over to. With the work you have done on your Avatars (target audiences), what themes of content do you already work with? How could you repurpose or take a bit from that to do a Facebook LIVE session on? Perhaps there is something that is drill on subject which has legs for more conversation on. 2 – What does your audience like, love and adore about you (your business, your service, your product)? Write down what these things are – create FAQ’s; behind the scenes; “how-to”s; Topic of the Week; Solution Spots; Live Q and A; you name it. 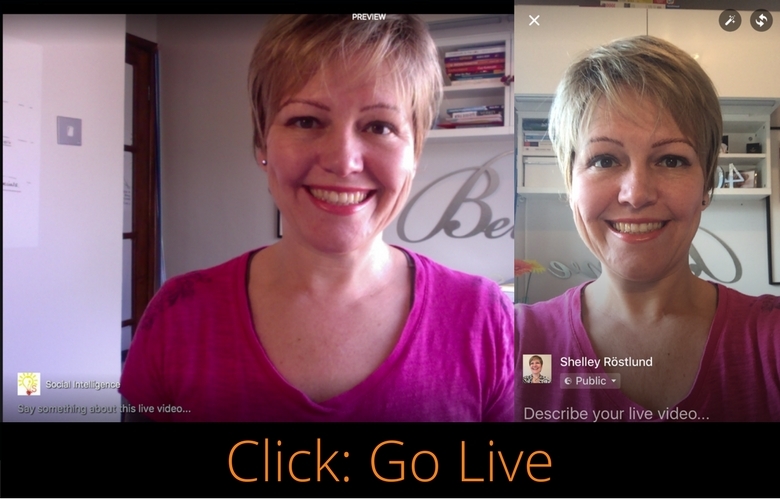 Once you have broadcasted your Facebook Live session – then use it. Create a blog post which you can embed the Live video into, or direct people through an email marketing campaign to your latest Facebook Live session (remember you have a unique URL for every piece of content you create on Facebook) and invite them to join you on your next session. You can also download the video and then clip it to make other shorter clips you can re-use for Instagram or Twitter. 1. My friend Ian Anderson Gray at Seriously Social is just brilliant at testing tools – and he has created a full resource for you on Facebook Live (specifically) and how to use OBS (free tool which you use on your desktop to go Live and you can share your desktop with your audience) or Wirecast (paid tool). Read that bumper post called “How to Broadcast from your Computer to Facebook Live” now. 2. Luria and David at Livestreaming Pros are the people to follow on Live streaming as a whole. They have a great description about the different levels of streaming and a quiz to help you work out which level you are (or want to be). Read “The 4 Levels of Live Streaming” now. Lucia also did a behind the scenes Live on the 5 sets they have within their house if you want to check that out too! 3. 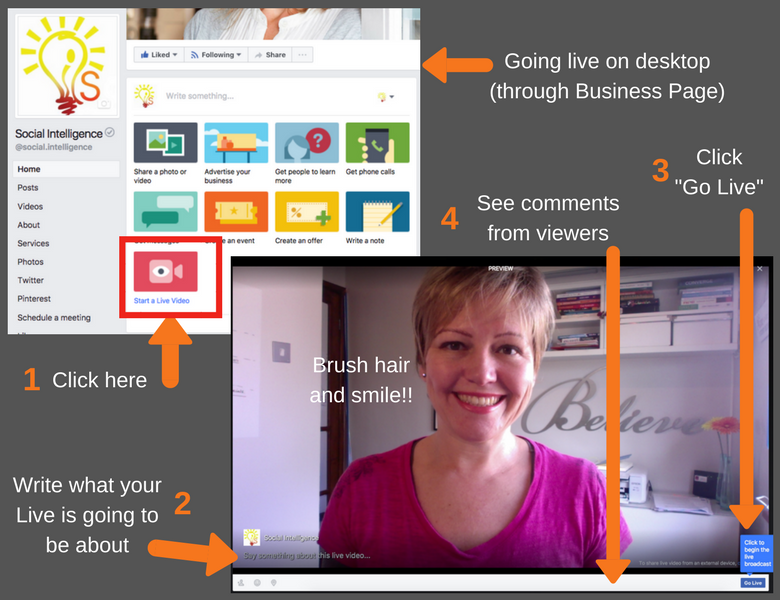 Mari Smith (the “Queen of Facebook”) does a lot of Live streaming and has put together a bundle of kit that she uses for her mobile Live sessions (when she is out and about). 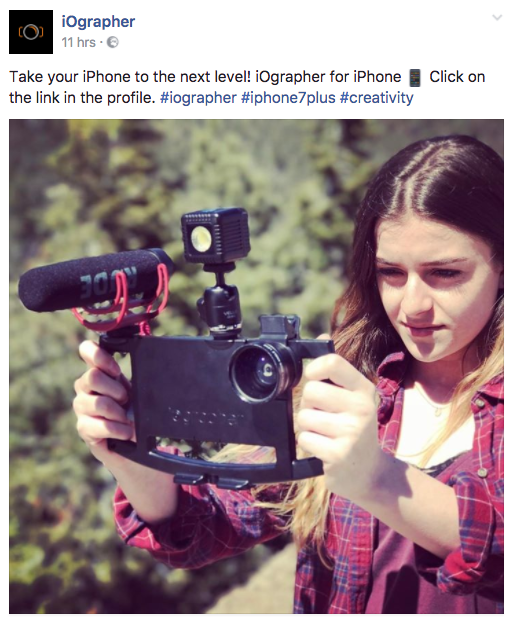 She has an iPhone 6+ (currently) and uses this kit for great sound, lighting and a steady hand. Dave Basalt at iOgrapher has put together a Mari bundle you can check out. 4. Joel Comm did a really comprehensive blog post on Social Media Examiner’s Blog zooming in on going live in 360 (think panoramic…but on epic scale). Read this post “How to Facebook Live 360 video for Marketing” as soon as possible if this is something up your alley. Got any questions? Pop them below and I’d happy to help.